Years ago, a friend gave me a small bottle of aged balsamic vinegar — the real stuff, from Modena, Italy. At that point, I had never experienced this mellow and thick, almost sweet, vinegar and I savored every last drop of that bottle. The terrific thing is that you really don’t need to spend twenty or thirty dollars for this spectacular condiment. 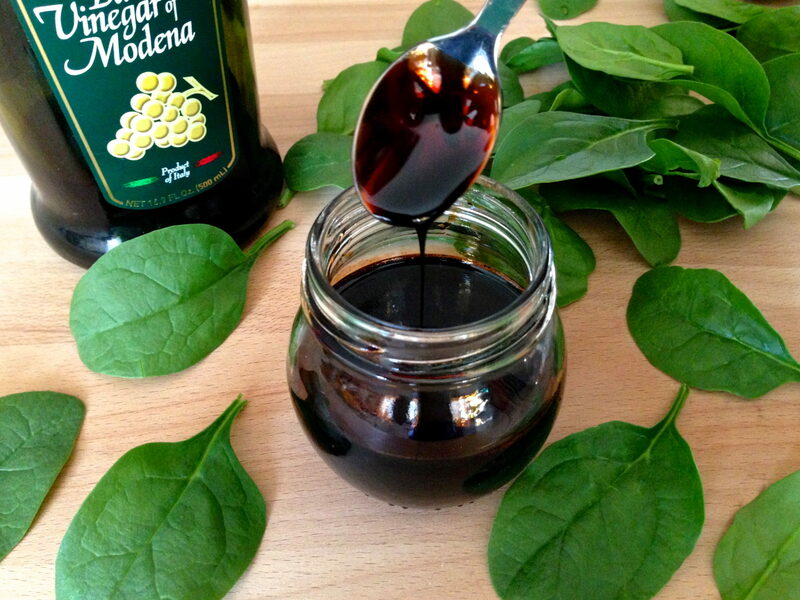 One of my favorite salads is topped with a delicious, syrupy balsamic. The salad is so easy because all you need to finish it off is a drizzle of this singular ingredient. If you simply take a few minutes one day to simmer an inexpensive variety, you can nearly replicate the real stuff. After a little experimenting, I found the trick: just a touch of honey stirred in at the end to match the sweet mellowness of the aged Italian variety. That and simmering just enough…but not too much. The following simple instructions should help you produce a jar that will rival the best of Modena. And consider my go-to, busy-night salad, using seasonal, winter produce. Though you can throw it together in a flash, it tastes nothing short of gourmet! Simmer the balsamic vinegar in a small saucepan until reduced by about half. If you cook until the vinegar looks thick and syrupy while still hot, it may very well taste burned. It will thicken as it cools. Better to stop cooking too early. If the vinegar is too thin once cooled, simply simmer for a few additional minutes. Once it reaches room temperature, you want a consistency similar to that of maple syrup. Precise simmering time will vary depending on pot size and stove type. When cooled slightly, taste the vinegar, and if the flavor is still a touch too acidic for your liking, add the honey, to taste. This will replicate the sweetness of a true balsamic. Stored in a glass jar in your pantry, the vinegar will keep for months. After you try the technique once, you may wish to double future batches. This recipe is featured on Recipes for my Boys’ Thursday’s Treasures. Can’t wait to try it! I love balsamic anything. I hope it’s a hit and the tips are helpful! That sandwich sounds divine and now you can make it yourself and it will be every bit as good! Just follow the tips so as not to over-reduce. I think you will love it! This sounds too yummy and too easy! I can’t wait to try it. It is, Sandy! Almost the only way to go wrong is to over-reduce which is why I suggest erring on the side of caution and taking off the heat a little early the first time. It is so easy to put it back on the burner if it is not syrupy enough. Enjoy! Fresh spinach in the fridge – reaching for the pan and vinegar right now! I hope you love it, Tracy! Thanks for letting me know, and feel free to report back on your progress! I use Splenda brown sugar and reduce my balsamic with that. Thanks for the comment, Gloria! I tried this today. It was fantastic! Thank you! Glad you liked this! It’s so good by itself that I usually use this reduction as the dressing or drizzle it over fish, grilled chicken, etc. For a basic balsamic vinaigrette, I love this easy recipe: https://fountainavenuekitchen.com/favorite-balsamic-vinaigrette/.